We ordered an SFP+ for our older Procurve switch. FS.COM reached out to us to get our switch model number to verify it was 100% functional. We received it and put it to work immediately. It's working terrific and the extra effort to confirm it worked BEFORE it was shipped was icing on the cake. FS test center is very awesome and I found my switch in FS website, as well as true picture of the test. So I made an order without any concern, and now they work great. FS.COM really saved our project. I chose overnight service because this order was quite urgent. and I received the order the next day. I did some initial tests on them. Everything is working as expected! I bought this for the project of our two sites located in two cities, low loss and work well, will bought more next time. I'm so excited! I often bought 10GBASE-ER modules from FS.COM before and the price was 176 dollars. One day, my sales, Vicky told me this module was in promoting and the sale price was 149 dollars. I ordered 20pcs without hesitation. As I bought many times, I trust their quality. So price drop is really a good new to me. It's a right decision! we've received the SFP modules without any problem, and we've already tested the CISCO SFP+ SR and ER modules in our Cisco Nexus 7710 switches. It's working without any problems, the DOM also works. 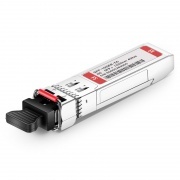 I ordered Dell 10G ER modules for my device, but I can't get them worked, I told my sale representative that I used it on Dell R730 with the Intel X520 LOM, when I plugged in, I don’t get any link light at the server, I do get link lights at the data switch, It is plugged into a 10GB Cisco switch, SG350XG-48T. The Cisco works fine with other devices. Soon, she gave me feedback that the modules are used on Intel X520 LOM card, so in fact I need to choose Intel compatible modules, their tech have made a test. Then I replaced the products smoothly, and I received the new items just now, they work well! It's my fault to choose the wrong products, but they help me with the replacement unconditionally, I appreciate. Compatible and Consistent, haven't had a problem with any so far. No compatibility problems so far, and I'm using on a fairly wide variety of hardware. They seem to have consistent performance (i.e. multiple units produce consistent input/output levels). I use these in my home network,works in Juniper QFX5100-48s. I have used this module for about 3 months, and so far, excellent performance/reliability. No complaints or issues whatsoever. The vendor, FS.COM shipped promptly and packaged well.This product works perfectly and is significantly less expensive than enterprise-grade options. I placed a test order with FS.COM since I was quite worried about the compatibility of the transceivers, but my Account Manager send me the test result of their device, which is helpful for me to make the decision. Really a good service, the transceivers are working perfectly on my device. 5 stars for them!